A new Chapter for Battlefield™ V* is imminent – and this one’s flaming hot. Whether you’re new to Battlefield V or a skilled veteran, Chapter 3: Trial by Fire is bringing plenty to be excited about – hence this first article in a series detailing how it will evolve the battlefield. With that, let's go through the most frequently asked Trial by Fire questions and see what the Chapter’s first weeks will entail. What is Chapter 3: Trial by Fire? Continuing the evolution of Battlefield V, Trial by Fire is the third Chapter of the game. 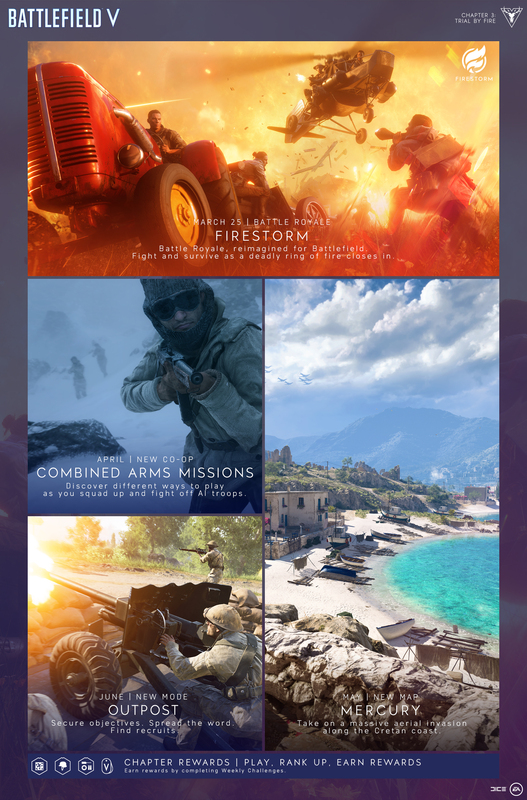 Delivered as free updates to Battlefield V owners, Chapters bring several new ways to experience the game, through maps, modes, missions, and more – some exclusive to the duration of the Chapter, some permanent. Chapter 3: Trial by Fire starts on March 28 and will be active for 12 weeks. Firestorm – battle royale, reimagined for Battlefield – will, however, be playable earlier, on March 25. Check in to Battlefield V regularly during Chapter 3: Trial by Fire, as we’ll add challenges and rewards on a weekly basis. What new content and features are in Chapter 3? In a nutshell: the climactic battle royale of Firestorm, the stunning Mercury map portraying the Battle of Greece, more co-op in a Combined Arms update, the strategic Outpost mode, and even more. That’s a lot. Let’s break it down. 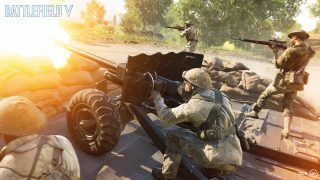 Combined Arms is the Battlefield V co-op experience, where you can improve your skills before taking on multiplayer by squading up and fighting AI troops. As Combined Arms gets updated in April, you’ll get to enjoy matchmaking and two Fjell 652 map missions. When this Battle of Greece map arrives in May, you’ll experience unexplored fronts as the fight moves to the Mediterranean. Here, you'll take on a massive invasion along the Cretan coast, based on the real-life events of Operation Mercury. The Battle of Greece will continue with another new map coming in Chapter 4. Squad Conquest, a multiplayer experience we introduced during Chapter 2: Lightning Strikes is coming back for a limited time during Chapter 3: Trial by Fire. In this fast-paced, 8-versus-8 take on Conquest, two pairs of opposing squads compete to strategically capture and hold flags until they exhaust the enemy team of their Respawn Tickets. During Tides of War, we're adding twists on existing multiplayer modes based on new ideas and community wishes. The idea is to test introduce these mode variants for a limited time and, potentially, bring them back if they're popular. For example, the first mode variant you'll see in Chapter 3: Trial by Fire is Grind - a tight, close-quarter take on Conquest. Here, we've reduced the playing field and number of flags on the Twisted Steel, Devastation, Rotterdam, and Narvik maps to create high-intensity infantry areas - meat grinders if you will - to cater for a certain play style. Fans of Battlefield 3's Operation Metro and Battlefield 1's Fort de Vaux will love this one. What are the competitive system requirements? As Firestorm approaches, Nvidia has recommended competitive specs for PC configurations that meet the needs of performance gaming with high refresh monitors. For players on high-end PCs, these specs will provide an idea of what it will take to get the best performance levels from their rigs. You can read more about minimum, recommended, and DXR-related specs on our PC system requirements page. What are the Weekly Challenges in Chapter 3? There will be 12 Weekly Challenges in Chapter 3: Trial by Fire. Each week, you’ll have the opportunity to unlock awesome weapons, skins, and other items by completing tasks on the battlefield. Gear like the Commando Carbine, the Firestorm Fire Axe melee weapon, and more is waiting for you – find a detailed list of the first six weeks, their tasks, and their rewards on the Chapter 3 page. Are you changing the structure of the Weekly Challenges? Yes, in two ways. First, to make things clearer, we’re moving away from the concept of Chapter Events to instead focus solely on weeks and Weekly Challenges. Second, some Weekly Challenges will feature a bonus task available after completing the final task and unlocking the reward. This extra exercise challenges you to use your newly acquired reward. For instance: in Chapter 3, Week 4, you’ll unlock the Commando Carbine at the end of the Weekly Challenge. You can then take your carbine out for a spin in the bonus task Silent Death, where you need to score five kills with it. There you have it, another vast Chapter for Battlefield V to sink your teeth in. Keep checking in to the game to make sure you’re not missing anything, and give it your all on the constantly evolving battlefields. We will see you there.